Friday Night Fights: Feet Of Adamantium! Technically, this kick doesn't K.O. the Hulk, but it does hurt him. A lot. Friday Night Fights: Feet Of Fury - Round 11: Pure Energy! Last week in Friday Night Fights: Feet of Fury! , I noticed I had followed up past victories by posting a Legion of Super Heroes entry in the next round. So last week I posted another follow-up Legion entry....and won again. So that means another Legion entry this week for Round 11. Only this time I'm changing things up a bit: The Legionnaire with the feet of fury isn't Karate Kid. It's Drake Burroughs, aka Wildfire. Or rather, as he is known at the time of this story, ERG-1. Our fight takes place in Superboy and the Legion of Super-Heroes #201, in a story called "The Betrayer From Beyond", written by Cary Bates and drawn by the late, great Dave Cockrum. 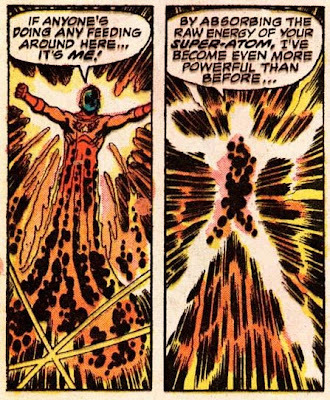 It's Legion Membership Tryouts Time again, and this issue focuses on an applicant named Molecular Master who has the power to make atoms really big. He makes it past the first round (not surprisingly, considering that his competition consists of such luminaries as Infectious Lass and Porcupine Pete). But there's one little problem: He's really an android who's been programmed to kill the Legionnaires and steal the Miracle Machine. The one thing standing in his way? The aforementioned ERG-1. 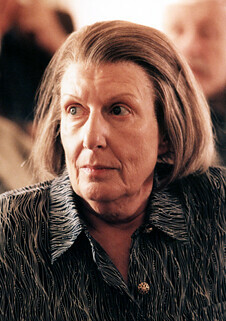 How powerful are you, ERG? It's up for debate whether that's technically a kick, but you can't deny that's some furious footwork. And you won't hear Molecular Master complaining. Friday Night Fights: Feet of Fury! - Round 10: Legion Time! After I found out I won last week's round of Friday Night Fights: Feet of Fury! , I noticed a trend the other two times I won a round: Both times I followed up my victory by posting a Legion of Super Heroes-related entry in the next round. 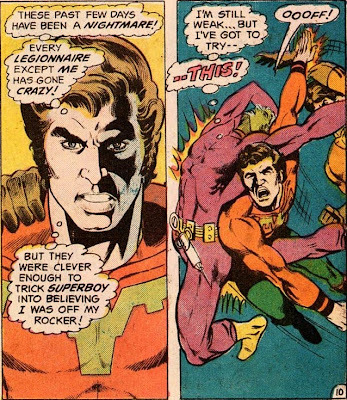 Tonight, for Round 10, I have some more Legion violence on hand, courtesy of Superboy and the Legion of Super-Heroes#205 , "The Legion of Super-Executioners! 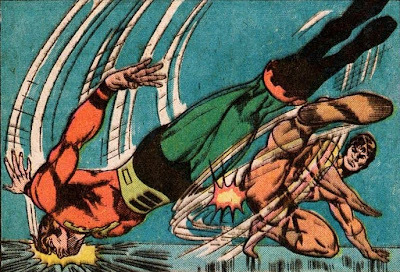 ", written by Cary Bates and illustrated by Mike Grell. 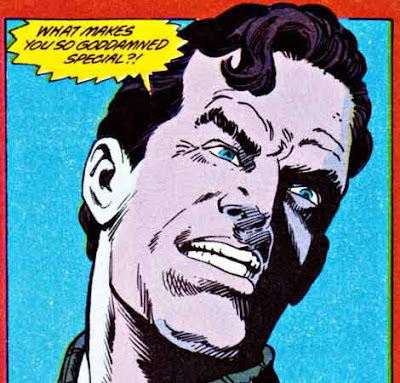 In this story, the Legion is being mind-controlled by a mysterious villain. Ultra Boy is immune to the brainwashing. Even when he's not in his right mind, Karate Kid will still mess you up good. If Only Carrie Prejean Had Seen This.. Here's a special Public Service Announcement from The Office. Friday Night Fights: Feet of Fury -Round 9: Punishing Kick! Round 9 of Friday Night Fights: Feet of Fury comes from the pages of Amazing Spider-Man#129, by Gerry Conway, Ross Andru, Dave Hunt, and Frank Giacoia. This issue features the first apearance of Frank Castle, better known as the Punisher. Here we spotlight how Spider-Man defeats the Punisher. 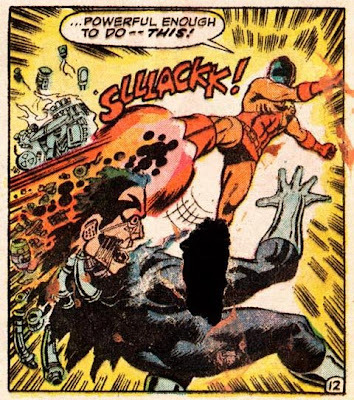 I wish I could show more panels of this fight, but our host Spacebooger has ruled that we must use only three consecutive panels ending in a KO kick. His house, his rules. 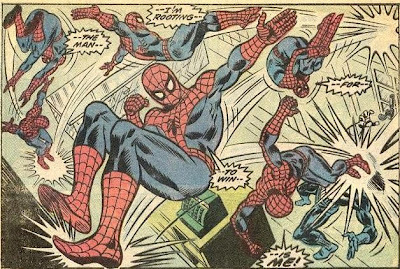 And here's where it gets awesome: Spidey sets up his final knockout kick by bouncing off every wall in the room while simultaneously talking like William Shatner. 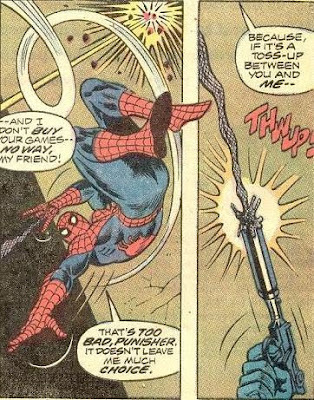 Believe it or not, Spidey did this a lot in the 70's. And DOWN goes the Punisher! Bonus: In the spirit of G7, I'm including "Bouncing Around The Room" by Phish as our musical score for tonight's fight. Thanks, Saranga! Enjoy these with my compliments!